The author identifies himself as "James, a servant of God and of the Lord Jesus Christ," who is writing to "the twelve tribes scattered abroad" (James 1:1). The epistle is traditionally attributed to James the brother of Jesus (James the Just), and the audience is generally considered to be Jewish Christians, who were dispersed outside of Palestine due to persecution. that the letter comprises material originally from James but reworked by a later editor. The writer refers to himself only as "James, a servant of God and of the Lord Jesus Christ. "[Jas 1:1] There are seven possible authors of James. As many as six different men may be referred to in the Bible as James, and if none of them wrote this letter, a seventh man not mentioned in the Bible by the name of James could be the author. Jesus had two apostles named James: James, the son of Zebedee and James, the son of Alphaeus, but it is unlikely that either of these wrote the letter. James, the son of Zebedee, was martyred about 44 AD. That would be very early for him to have been the writer. The other apostle James, the son of Alphaeus, is not prominent in the Scriptural record, and very little is known about him. 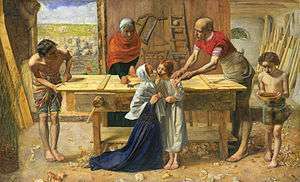 Christ in the House of His Parents An illustration including James, the brother of Jesus. Rather, evidence points to James, the brother of Jesus, to whom Jesus evidently had made a special appearance after his resurrection described in the New Testament. This James was prominent among the disciples. The writer of the letter of James identifies himself as "a slave of God and of the Lord Jesus Christ" in much the same way as did Jude, who introduced the Epistle of Jude by calling himself "a slave of Jesus Christ, but a brother of James" (Jas 1:1; Jude 1). Furthermore, the salutation of his letter includes the term “Greetings!" That was same way as the letter on circumcision that was sent to the congregations. In the latter instance it was apparently Jesus's brother, James, who spoke prominently in the assembly of "the apostles and the older men" at Jerusalem. 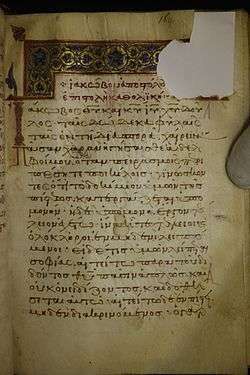 From the middle of the 3rd century, patristic authors cited the Epistle as written by James, the brother of Jesus and a leader of the Jerusalem church. Not numbered among the Twelve Apostles unless he is identified as James the Less, James was nonetheless a very important figure: Paul described him as "the brother of the Lord" in Galatians 1:19 and as one of the three "pillars of the Church" in 2:9. He is traditionally considered the first of the Seventy Disciples. If written by James the brother of Jesus, it would have been written sometime before AD 70. Jerusalem would also be the place of writing. Some scholars believe that the Epistle of James should be understood in its historical context. Understanding the circumstances of James' writing helps them better understand James' organization of the letter. They view the epistle as having a legitimate purpose for its composition, a response to the suffering of its recipients. A 2013 journal article explores a violent historical background behind the epistle and offers the suggestion that it was indeed written by James, the brother of Jesus, and it was written before AD 62, the year he was killed. The 50s saw the growth of turmoil and violence in Palestine, as Jews became more and more frustrated with corruption, injustice and poverty. It continued into the 60s, four years James was killed. War broke out with Rome and would lead to the destruction of Jerusalem and the scattering of the people. The epistle is renowned for exhortations on fighting poverty and caring for the poor in practical ways (1:26–27; 2:1-4; 2:14-19; 5:1-6), standing up for the oppressed (2:1-4; 5:1-6) and not being "like the world" in the way one responds to evil in the world (1:26-27; 2:11; 3:13-18; 4:1-10). Worldly wisdom is rejected and people are exhorted to embrace heavenly wisdom, which includes peacemaking and pursuing righteousness and justice (3:13-18). This approach sees the epistle as a real letter  with a real immediate purpose: to encourage Christian Jews not to revert to violence in their response to injustice and poverty but to stay focused on doing good, staying holy and to embrace the wisdom of heaven, not that of the world. That passage has been cited in Christian theological debates, especially regarding the doctrine of justification. Gaius Marius Victorinus (4th century) associated James's teaching on works with the heretical Symmachian sect, followers of Symmachus the Ebionite, and openly questioned whether James' teachings were heretical. This passage has also been contrasted with the teachings of Paul the Apostle on justification. Some scholars even believe that the passage is a response to Paul. One issue in the debate is the meaning of the Greek word δικαιόω (dikaiόο) 'render righteous or such as he ought to be', with some among the participants taking the view that James is responding to a misunderstanding of Paul. Martin Luther's description of the Epistle of James changes. In some cases, Luther argues that it was not written by an apostle; but in other cases, he describes James as the work of an apostle. He even cites it as authoritative teaching from God and describes James as "a good book, because it sets up no doctrines of men but vigorously promulgates the law of God." Lutherans hold that the Epistle is rightly part of the New Testament, citing its authority in the Book of Concord, however it remains part of the Lutheran antilegomena. ↑ Davids, Peter H (1982). I Howard Marshall and W Ward Gasque, ed. New International Greek Testament Commentary: The Epistle of James (Repr. ed.). Grand Rapids, Mich.: Eerdmans. ISBN 0802823882. 1 2 3 Camerlynck, Achille. "Epistle of St James". The Catholic Encyclopedia. Retrieved 16 May 2012. 1 2 McCartney, Dan G (2009). Robert W Yarbrough and Robert H Stein, ed. Baker Exegetical Commentary on the New Testament: James. Grand Rapids: Baker Academic. ISBN 0801026768. ↑ Moo, Douglas J (2000). D A Carson, ed. The Letter of James. Grand Rapids: Wm B Eerdmans Publishing co. ISBN 0802837301. ↑ Adam Clarke,1821, commentary on 5:13, 22, 23. ↑ Bechtel, Florentine. "The Brethren of the Lord". Catholic Encyclopedia. Retrieved 16 May 2012. His identity with James the Less (Mark 15:40) and the Apostle James, the son of Alpheus (Matthew 10:3; Mark 3:18), although contested by many Protestant critics, may also be considered as certain. ↑ Shillington, V. George (2015). James and Paul: The Politics of Identity at the Turn of the Ages. Minneapolis: Fortress Press. pp. 65–96. ISBN 978-1-4514-8213-3. ↑ "History of the Christian Church, book 7, chapter 4". ↑ "Epistle of James". 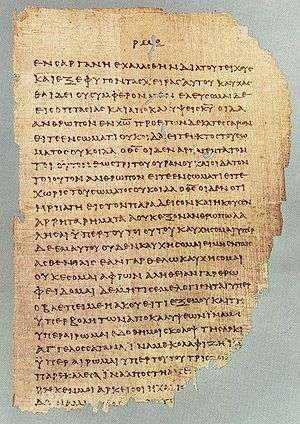 Early Christian Writings. Retrieved 16 May 2012. 1 2 John Barton and John Muddiman, ed. (2001). The Oxford Bible Commentary. Oxford: Oxford University Press. p. 1256. ISBN 0198755007. ↑ Johnson, Luke Timothy (1996). The Real Jesus. HarperOne. p. 121. ISBN 0060641665. 1 2 Blomberg, Craig (2008). James. Grand Rapids: Zondervan. p. 23. ISBN 9780310244028. ↑ Martin, Ralph (1988). James. Waco, TX: WBC. p. xcviii - civ. ↑ Johnson, Luke (2000). The Letter of James. Grand Rapids: Pillar. pp. 11–16. ↑ Some numerous writers and commentators assume so, like William Barclay, The Daily Study Bible, rev. ed., 17 vols. (Philadelphia: The Westminster Press, 1976), Vol 14, The Letters of James and Peter, p. 28. ↑ Taylor, Mark (2006). A Linguistic Investigation into the Discource Structure of James. London: T&T Clark. ISBN 9780310244028. ↑ Eberhard Nestle, ed. (2011). Greek New Testament With Revised Concise Greek-English Dictionary. (4th Revised ed.). Hendrickson Publishers. ISBN 1598567209. ↑ On the death of James, see Josephus Antiquities, 20.9.1 and Eusebius II.23.1-18. ↑ Numerous studies argue convincingly for a letter- structure to James. See, for example, Euan Fry, "Commentaries on James, I and 2 Peter, and Jude," The Bible Translator, 41 (July 1990): 330, and F.O. Francis, "The Form and Function of the Opening and Closing Paragraphs of James and I John," ZNW 61 (1970):110-126. ↑ McKnight, Scot (2011). The Letter of James. The New International Commentary on the New Testament. Grand Rapids, Michigan: William B. Erdmans. pp. 259–263. ISBN 978-0-8028-2627-5. ↑ "Dikaioo". Greek Lexicon. Retrieved 16 May 2012. ↑ "The Theological Virtues: 1815". Catechism of the Catholic Church. The gift of faith remains in one who has not sinned against it. But 'faith apart from works is dead':[Jas 2:26] when it is deprived of hope and love, faith does not fully unite the believer to Christ and does not make him a living member of his Body. ↑ Schaff, Philip (1877). "The Synod of Jerusalem and the Confession of Dositheus, A.D. 1672: Article XIII". Creeds of Christendom. Harper & Brothers. Man is justified, not by faith alone, but also by works. ↑ Calvin, John. "James 2:20–26". Commentaries on the Catholic Epistles. When, therefore, the Sophists set up James against Paul, they go astray through the ambiguous meaning of a term. ↑ "Faith and Works". WELS Topical Q&A. Wisconsin Evangelical Lutheran Synod. Archived from the original on 20 Dec 2013. Retrieved 30 Sep 2015. 1 2 Wells, George Albert (1971). The Jesus of Early Christians. London: Pemberton. p. 152. ISBN 0301710147. ↑ Davis, Glenn (2010). "Irenaeus of Lyons". The Development of the Canon of the New Testament. Retrieved 16 May 2012. ↑ Griggs, C Wilfred (1991). Early Egyptian Christianity (2nd ed.). Leiden: Brill Academic Publisher. p. 173. ISBN 9004094075. ↑ Schaff, Philip. History of the Reformation. The most important example of dogmatic influence in Luther’s version is the famous interpolation of the word alone in Rom. 3:28 (allein durch den Glauben), by which he intended to emphasize his solifidian doctrine of justification, on the plea that the German idiom required the insertion for the sake of clearness.464 But he thereby brought Paul into direct verbal conflict with James, who says (James 2:24), "by works a man is justified, and not only by faith" ("nicht durch den Glauben allein"). It is well known that Luther deemed it impossible to harmonize the two apostles in this article, and characterized the Epistle of James as an "epistle of straw," because it had no evangelical character ("keine evangelische Art"). ↑ Stonehouse, Ned B (1957). Paul Before the Areopagus. pp. 186–197. ↑ "Lutheran Church - Missouri Synod - Christian Cyclopedia".